The Music Academy, Madras today announced that 'Çhitravina' Ravikiran will receive the 'Sangita Kalanidhi' award for 2018. N. Ravikiran, a musician who displayed his talent from the age of 2, has been consistently presenting chaste music since his early childhood. He is a performer, composer, guru and artistic director for North American Melharmonic Honors Orchestra. 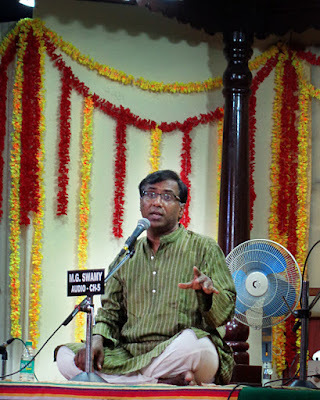 Son and disciple of guru Chitravina Narasimhan, Ravikiran later trained under the veteran musician T. Brinda. He is equally adept in playing Chitravina, a 21 stringed instrument and presenting vocal music. He has conducted workshops and learning sessions in India and abroad. He has a host of disciples in many countries, whom he teaches online and in person whenever he visits those countries or the students visit him in India. His lec-dem sessions are popular for their rich content. This short documentary of Ravikiran's music and various roles as a musician from 2014 on CNN summarises his career span of more than 45 years. 'Çleveland' V V Sundaram, an organiser and music patron opines - "A performer of extraordinary merit, a musicologist of high repute, a composer with rare distinction, a Guru with few equals and a global ambassador for Indian classical music - these and many other attributes make this Genius a very deserving candidate for this honor," on his Facebook post, congratulating Ravikiran on the award. June is that of the year when music rasikas start discussing the awards to be conferred on musicians during the season. The Music Academy's 'Sangita Kalanidhi' award becomes the topic in every Carnatic music forum online and offline. There are polls and casual comments on Social Media and everyone wish their favourite artiste received the award. This announcement puts all the speculations and discussions to rest for this year. Ravikiran will preside over the 91st annual conference of The Music Academy to be held between December 15, 2017 and January 1, 2018. The award will be conferred on him on January 1, 2018.